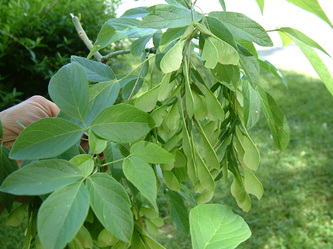 The Box Elder grows from 50-75 feet tall, and is 2-4 feet in diameter. The leaves are opposite and are pinnately compound with 3-5 leaflets with few coarse teeth or no teeth at all. The trunk bark is furrowed. The fruits are paired "keys." The flowers are dioecious (male reproductive structures and female reproductive structures occur on two separate plants), drooping, and appear a little before the leaves. The soft, white wood is used for boxes. Syrup can be made from the sap. 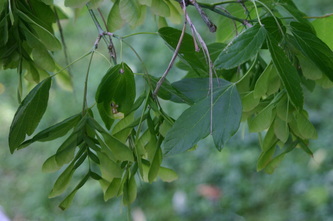 It is the only maple with compound leaves. This tree flowers April-May and is common along streams.